As I've mentioned a couple of times before, I'm supporting Barack Obama for president. I've been contributing regularly to the campaign because I believe this election is really important and that Obama has the potential to finally lead America back into the world community and into the twenty-first century. The challenges are great and I have no illusions that Obama is something magical, "the One" or whatever. But I've read his books and studied his positions. He's real. He's smart. He's practical. He cares. He knows he can't do it alone, and he will build a great team. He actually gets it. And McCain is clueless. If you're an American and you are undecided, or if you don't know much about Obama - please take some time and learn about him and what he represents. Learn about McCain too. And if you support Obama, contribute to the campaign if you can. This truly is about the future, and it's important. Thanks. I was checking on Orbit Hangar for new Orbiter add-ons, and I noticed one from Brian Jones that I hadn't seen before, a set of Japanese exploration missions based on the JAXA M-V launch vehicle series (MV Missions). 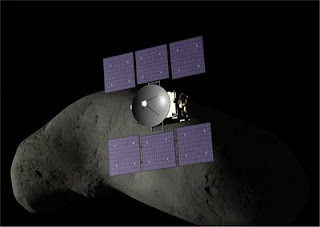 These include the Nozomi mission (which failed to reach Mars), the canceled Lunar-A mission, and the partly successful Hayabusa mission that launched from Japan in 2003 and visited asteroid 25143 Itokawa in fall 2005. As usual, Brian includes a lot of detail in this add-on, including the M-V launch pad area at Uchinoura and the rubbly and potato-like Itokawa itself. 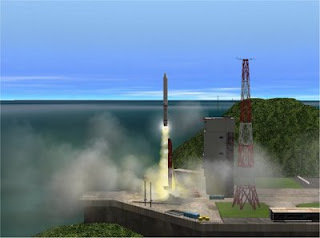 There are animations and multiple scenarios including the chance to land on Itokawa to collect a sample for return to Earth, simulating what Hayabusa apparently failed to complete in 2005. I have only played a bit with Hayabusa, not the other two. This add-on is a great value for the price (which is zero, as usual for Orbiter add-ons and Orbiter itself). Nice work, Brian. I'd like to play some more but I have to pack up and go to sleep. I'll be flying over Japan tomorrow en route from Taiwan to SFO (and eventually back to BOS). This is how it ought to be - NASAimages.org is a huge new web collection of all sorts of NASA images and videos hosted not by NASA, but by the Internet Archive (which hosts a lot of other stuff too, some of it pretty strange). You can browse by categories (among other methods) and display up to 250 thumbnails per page. There are some cool features for browsing, searching, embedding, and for creating media groups and presentations. I'm sure there are more features, but best of all is the easy access to zillions of NASA images. There are already a huge number of images and videos but they apparently plan to expand to millions of photos and thousands of hours of video. Way cool! I took a nice long walk this morning around the Hsinchu area where I'm staying this week. Every time I'm in Taiwan, I'm amazed by the number of motor scooters that dominate the traffic here. It's not as chaotic as traffic in India or most places in China that I've visited, and Hsinchu is not nearly as bad as Taipei (pictured here, photo courtesy of Poagao on Flickr). But it's still pretty much a sea of scooters in the morning rush hour, so you have to be careful crossing the street to get to Starbucks for your cafe mocha! Now this is thinking outside the box (or lens in this case). 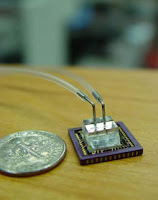 A Caltech engineer has developed a "microscope on a chip" that doesn't use any lenses. Instead, the liquid containing the cells or organisms of interest is run through microscopic fluid channels that pass over a sensor array chip like those in a digital camera. A thin metal layer blocks most of the pixels except for some tiny holes punched in the foil along the fluid channels. The size of these holes (not the pixel size of the detector array) determines the resolution, and the picture is "stitched together" digitally from the changing signals received by the sensors behind the holes. The device will take some time to commercialize, but if the $10 price is realized, optofluidic microscopy (OFM) could allow for small, hand-held, and inexpensive blood analysis devices and probably many other applications. I've read of some other examples of this sort of radical rethinking of what it means to record an image (can't find a reference at the moment). We've been working from a "fairly large lens and film-like detector that records the whole image all at once" model even in the digital camera age, but it seems there is more than one way to slice and dice light reflected from objects to form images when sensors and computers are cheap and easily configurable. Future cameras and other optical devices may not look anything like a camera does now. This page has a diagram of the device and some sample images from a prototype. Photo credit: Changhuei Yang, Caltech. Although there are a few graphs and diagrams and a lot of numbers and units, I think this book is accessible to any reader with a citizen's interest in energy, terrorism, nuclear weapons and nuclear power (not the same! ), and climate change. You don't have to consider yourself a future president to want and really need to understand this stuff - all elected officials and voters should have this level of familiarity with the science (and often engineering) behind these important issues. And it's really not that hard to follow - it's very readable. There are no equations here (OK, a few in the notes if you're interested), and the "physics" comes mainly in the approach, breaking problems down into essentials to which basic concepts like energy conservation and efficiency can be applied. A lot can be accomplished simply by converting energy and other quantities in different situations into common units and comparing them (Muller uses mainly common US units rather than metric units that physicists use in their real work). It is true that Muller does not completely remove his own opinions in favor of "pure science" on some topics - but this is a book for general readers, not a text book (he also has a text book version for his course at UC Berkeley). And the issues are real-world issues, not abstract physics problems. But for the most part he is combining basic science with logic and common sense, and if you learn to do this yourself, and remember some of the conversions and rules of thumb he discusses, you will be better able judge for yourself whether some claim about energy or terrorism really makes sense, and have a better calibration of risks and opportunities in this complex world. I was a physics major and have a masters in optics, but I also do educational outreach programs, so I'm really viewing this book more from the perspective of an educator and citizen than as a science-educated person. And I personally learned a lot. Blog P.S. There is also a section on space which is pretty good, though I wouldn't buy this book for its space related content. I didn't mention the space section in the Amazon review because I felt that the energy, nukes, terrorism, and climate change sections would be of more interest to the general reader. Isn't that a lovely ride? I’ve always liked James Taylor’s song “The Secret of Life,” the first line of which is “the secret of life is enjoying the passage of time.” That sounds desirable, and maybe even plausible, though it’s one of those easier-said-than-done things. But it’s the verse quoted above that got me thinking about the nature of time and how we experience it, compared to how we think about it in the context of science and history. Our subjective experience of time must have evolved just like every other aspect of our physical and mental characteristics, and it seems to be related to consciousness (whatever that is!). In hunter-gatherer and even basic agricultural cultures, there are a few basic time scales, and not much need for precision. Your body needs to be able to sense and react in fractions of a second to detect and properly respond to movement associated with predators and prey, and to be able to throw things accurately. Without artificial light sources and timekeeping devices, you also need a sense of the day/night cycle to plan and accomplish those things you need to do in daylight, and to seek safe shelter for night time. This scale comes pretty naturally from the apparent movements of the sun and the stars. You also need a sense of the seasonal/annual cycle to judge the likely availability of food sources, and for planting and harvesting. There are environmental cues for this scale too – the changing length of the day, changes in weather, the location of the rising and setting sun, and the patterns of stars that change with the seasons. Early humans spent a lot of time outdoors and certainly would notice these things more than most people do these days. The longest time scale for most basic human activities would be essentially your lifetime, say 20-100 years. Children grow and change noticeably on scales of months to years, and our faces and bodies change through adulthood. Beyond a lifetime, you need some sort of artifact to keep track of time. Before writing, there were oral traditions, stories memorized and passed on to children to help preserve traditions and know-how and to provide some sense of continuity. This might be counted in generations, but here is where it starts to get somewhat abstract, when you think about what happened before your life and what might happen after you die. These seem to be the natural and easily understandable human time scales, and anything outside of this range is going to require something beyond your own senses. Writing allows records to extend beyond a lifetime more reliably than oral storytelling. Calendars and simple timekeeping devices like an hourglass or sundial make it possible to measure time and to compare ideas of time with other people. Subjective time starts to have some objective milestones. Where this all breaks down is when science and history start to tell us about events and phenomena that fall outside these individual human time scales. I know about all sorts of events with all sorts of time scales – e.g., different events in a computer take place in nanoseconds to microseconds (CPU and memory operations) or milliseconds (disk operations), different by factors of thousands to millions, but all too short for me to comprehend in any direct sense. At the other end, we have geological and cosmological events happening over scales of many thousands to millions to billions of years. While I can use analogies like the cosmic calendar (here's Carl Sagan explaining it) to understand these time scales in some sort of abstract way, I can’t directly or emotionally comprehend how long even 500 years is, let alone ten million or thirteen billion years. I accept the reality of these time scales, and since I have read and studied a lot of science over the years, I perhaps have more familiarity with “scientific time” than the average person. But even when the scientific evidence is clear, these enormous time scales are still literally mind boggling to me. So I can understand how it can be hard for some people to "get their head around" concepts like “continental drift” (plate tectonics) and evolution that require time scales so far beyond anything an individual human can experience or even imagine. I don’t know if the secret of life really is enjoying the passage of time. I’m not even sure whether time is really real (I do know that my 13 hour flight from San Francisco to Taiwan really seemed more like 30 hours). Or as somebody undoubtedly said before, maybe time is just nature’s way of keeping everything from happening at once. P.S. I'm re-reading Bill Bryson's A Short History of Almost Everything, which is great (more later I suppose). In chapter 21, he talks about how difficult it is for anything to get fossilized, and about trilobytes and other odd creatures of the "Cambrian explosion," referring to the geological period when complex life-forms somewhat suddenly appear in the fossil record, around 540 million years ago. To try to convey this distant age, he suggests you imagine that you can travel backwards into time at the rate of one year per second. At this rate, you reach the first century CE in about half an hour (2008 seconds), and the beginnings of human life in just over 3 weeks. But you would have to fly for almost 20 years to get to the start of the Cambrian period! As has been widely reported, a new study shows that girls and boys perform equally well in math. University of Wisconsin researchers reported on the study in Science magazine. "There just aren't gender differences anymore in math performance," says UW-Madison psychology professor Janet Hyde, the study's leader. "So parents and teachers need to revise their thoughts about this." I've always thought that the idea that girls aren't as strong in math as boys was something of a self-fulfilling prophecy and thus a very harmful stereotype. When I have done space-related educational outreach events for school groups and girl scout events, I have found girls to be every bit as curious about the universe and its workings as boys. I thought it was unfortunate that few of these smart girls would likely go on to pursue education and careers in science and engineering. I hope this new study will take away any excuse anyone might have for not encouraging girls (and boys) to do what they are good at and what they enjoy. I've just finished reading Steve Grand's second book, Growing Up With Lucy (how to build an android in twenty easy steps). He points out on the page just before the introduction that he lied about the number of steps, but never mind that. I'll even give away the ending. By the end of the phase of the project described in this book, his orangutan-inspired android "daughter" Lucy has learned to (sometimes) point at a banana. This may not sound like much, but it's actually a good step beyond Steve's earlier artificial life project, the computer game Creatures. The development of that game and of Steve's ideas about the nature of life and intelligence were described in his earlier book, Creation, which I wrote about in 2006. It's pretty amazing stuff - all the more so because the creatures in Creatures actually learn to do everything they do in their fairly complex 2D world. They have brains and immune systems and so on. Richard Dawkins has said that Creatures could be the closest that anyone has come to actually creating artificial life. But Steve was not content to stop there. As complex and realistic in some respects as the artificial life forms of Creatures could be, they still developed in a very limited 2D world. Steve makes the very logical point that we (humans and other mammals, mainly) do not exist as isolated "intelligences" but that intelligence and other attributes are consequences of having bodies that have to learn to survive in a real 3D world. With Lucy, he set out to create a "creature" that would actually have use for intelligence. In the Lucy book, he describes his ideas and his self-funded "non-disciplinary" research in more detail, in addition to describing the trials and tribulations of Lucy and her software-emulated muscles (driving real and very troublesome hardware) and brain structures (modeled on the overall architecture of the mammalian brain, with a visual and motor cortex and so on). It's a "synthesis" approach that makes a lot of sense, and his telling of it is quite clear and often quite funny. At the end of the book, Steve reports that his self-funding had just about run out when he fortunately received a UK foundation grant to continue the work for another year, allowing him to start work on a "Mark II" version of Lucy. That was around 2000 I think, and to learn more I'm afraid you will have to explore his web site (which has frames, alas, the de-framed Lucy part is here). It seems that Lucy is again (still?) on hold, but maybe things will change, and maybe someday Lucy-type robots will be common and will be called grandroids in Steve's honor. Then again, maybe not. In any case, this is a very clever, sometimes funny, and always thought-provoking book, and I highly recommend it. Now I have to pack for a lightning trip to Taiwan, leaving for the airport in about 11 hours. 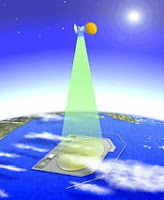 An October 2007 report to the National Security Space Office called "Space-Based Solar Power As an Opportunity for Strategic Security" (available here). Strange maybe, but at least DoD is an interested party with money! Japan has been testing SPS technology including power-beaming and plans to have an SPS in space by 2030 (JAXA concept picture shown). A new organization called SSAFE (Space Solar Alliance for Energy Future) was announced last fall by NSS. SSAFE is a coalition of 13 research and space advocacy groups advocating investments in space-based solar power. NSS also has an extensive on-line library of books and other materials on space based solar power. A recent article in Air & Space Magazine also talks about the issues of space-based solar power. While there is great promise, and progress is being made, there are also many problems, including public perception of the safety of beaming power to Earth with microwaves (really not a major issue) and the fact that ground-based energy technologies are also developing faster now, reducing possible energy cost advantages of space-based solar. But in the long run, placing arrays of efficient solar cells in a place where the sun always shines is too good an idea to waste! Of course I knew space was big, but after metaphorically flying around for a few hours with a couple dozen space and astronomy bloggers who are just all over space, I had to pull up Adams’ quote for some perspective. 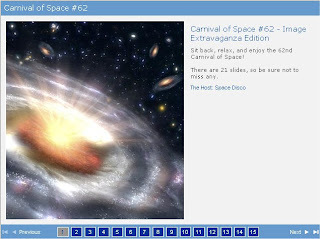 Welcome to the 64th Carnival of Space. It may not be the biggest ever, but it sure has grown since I hosted a few of the early and middle carnivals way back in 2007. Starting out in the depths of galactic space, Bad Astronomy asks how you can weigh a supermassive black hole in the center of some distant galaxy? Turns out there’s a clever new method – you take its temperature. What’s in a name? Star Stryder brings up active galactic nuclei as an example of astronomical objects that have many different names, which can sometimes cause problems. And in what may be a case for Galactic CSI, Free Space reports on a galaxy where something has been killing organic molecules! Moving into stellar range, Simostronomy tells us of three astronomers who worked with variable stars and who had an unusual and impressive common thread. And Centauri Dreams (approaching its fifth anniversary!) thinks about how to keep a blog about reaching the stars alive until someone actually reaches one, among other issues in communicating with the future. OK, back in the solar neighborhood. 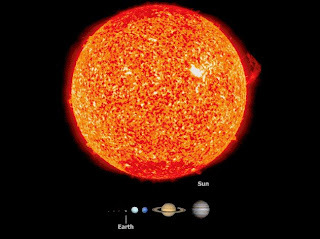 You know the sun is a star, but do you know what type it is? Astroengine tells us what it is and why. Cosmic Ray talks about Ceres and whether this largish dwarf planet in the asteroid belt might be an escapee from the distant Kuiper belt. Dawn may provide some clues when it visits this intriguing place in 2015. And Universe Today offers an interesting post about the possibility of colonizing Venus with floating cities! Several of this week’s bloggers wrote about the Moon, a few inspired by the 39th anniversary of the Apollo 11 landing on July 20, 1969. Stuart at Cumbrian Sky looks back at that day, wishing that the history had been better documented (no pictures of Neil Armstrong on the surface?). But he found out later that it was documented a bit better than he thought. Gumby the Cat wrote a nice Apollo 11 post, comparing NASA then and now (he thinks it was better then). I missed July 20 but compensated by remembering another historic event – the first launch of a human spacecraft from a body other than Earth on July 21, 1969. Naturally I used Orbiter and AMSO to simulate it and take a picture that Neil and Buzz couldn’t have gotten if they tried (see above). There were a few non-Apollo Moon posts, including Babe in the Universe who talks about the impressive video of the Moon transiting Earth, shot from the Deep Impact (now EPOXI) spacecraft. And My Dark Sky was blown away by the you-are-there high-def imagery of Tycho crater from Japan’s Kaguya Moon orbiter. Ken Murphy at Out of the Cradle discusses some 24 Moon-related children’s books from the 50’s and 60’s. I must have gotten some of those from the library way back then! Coming down to Earth, we have a few posts on observations and technology. Astroblog gives a progress report on building an orrery, a physical (not software) model of the solar system. Chris writes from Space Across the Pond on the Top Ten Telescopes. The selection and ranking are a bit arbitrary, but you can’t argue with Galileo (the dude, not the spacecraft) and Hubble (the spacecraft, not the dude). 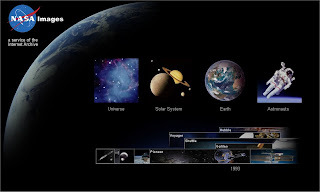 Visual Astronomy discusses astronomy software, including one of my freeware favorites, Stellarium. And in a case of “some bloggers have all the luck” (though not necessarily in gradeschool), Space Disco’s Dave Mosher will get to view the solar eclipse of August 1 from an airplane high above the Northern Arctic. There are no obscurations up there, except for the journalist in the window seat. Speaking of the Earth and dreidels (weren’t we? ), Starts With A Bang! has a great little lesson on how days on this spinning Earth are getting (very gradually) longer. And if you’ve got a spinning Earth, why not toss up a few carbon nanotube (CNT) fibers from the equator and make a space elevator? Next Big Future says that CNT fibers as long as 30 centimeters have been reported, with 1 meter possible soon. This bodes well for the eventual practicality of space elevator CNT ribbons, though there is still a long way to go (technologically and otherwise). Riding with Robots compares Mars and Earth, and they come up looking pretty similar (at least if you’re in Utah looking at rock formations). OK, we’ve got just a few more posts. CollectSpace offers several posts related to animals in space and/or in movies (mainly animated, except for a live Buzz Aldrin cameo). The animals in question are chimps, flies, and dogs (sounds like a Carnac punch line). Kentucky Space reports on a new documentary, Apollo’s Orphans, about a group of American and Russian space officials who tried to save the Mir space station. Wow, that was a pretty long carnival! I hope you enjoyed this guided tour of some of the week’s space and astronomy blogging. To learn more about the Carnival of Space, visit Universe Today. NASA's Astronomy Picture of the Day certainly takes a broad view of "astronomy," and today's APOD is a case in point. Titled "Happy People Dancing on Planet Earth," it's the popular and smile-inducing video by Matt Harding, a guy who records himself (and sometimes many local helpers) doing a rather goofy little dance in scenic locations all around the world. There's even an underwater dance and a zero-G dance (in "Nellis Airspace, Nevada"). The music is cool too. I've seen it three or four times now, and I still have to smile. Somewhat like 2008, 1973 was a pretty crappy year. Nixon was president. We were still in Vietnam. Arab-Israeli War. OPEC oil embargo. Gas lines (gas went from 38 cents a gallon in May 1973 to 55 cents in June 1974, oil quadrupled to $12 a barrel in 1974). Recession. Apollo was over. I was still in college but spending most of my time with music - listening, writing, singing, recording. That was cool except for being dirt poor and having to take a full time job in a psych hospital to live (and eventually finish my physics degree when I finally realized that I wasn't the next Elton John or James Taylor). 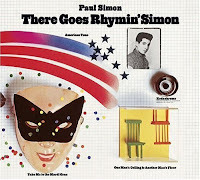 That May one of my favorite albums by one of my favorite writer/artists was released, There Goes Rhymin' Simon by Paul Simon. Al Gore said in a speech the other day that we need to move within ten years to 100% renewable energy sources for our electricity. I think he's right - we need to try anyway, really try. As many have done recently, he cited the Apollo timetable from JFK's speech to Apollo 11's landing as evidence that when it's really important, we can do amazing things, even though we are far from perfect, and we all have lives to go on with. I think we can do amazing things too, and for some reason it reminded me of a song from that 1973 album. I can't believe I missed blogging about the 39th anniversary of Apollo 11 landing on the Moon yesterday! Next year I'll pay closer attention, but it will be the 40th and it will probably be more widely noticed anyway. So I will commemorate something that did happen 39 years ago today: the liftoff of Apollo 11 from the Moon at 17:54 UTC on July 21, 1969. 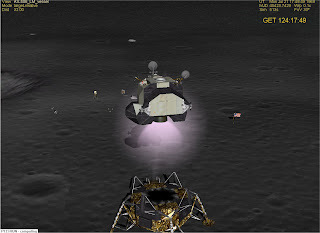 This Orbiter screen shot (with the AMSO add-on) shows the ascent module just after liftoff from Tranquility base, with the EASEP scientific instruments to the left, and the US flag to the right. According to Buzz Aldrin, the the real flag was blown over by the engine exhaust (later missions planted the flag farther away from the LM). AMSO simulates impressive dust clouds when you land on the Moon, but doesn't seem to kick up any simulated dust from the ascent stage exhaust. There was no video camera on the Moon to record Apollo 11's launch, but on Apollo 15 and later missions there were remotely operated cameras that sent back videos (like this one of Apollo 17). You can see some debris but not a lot of dust, so maybe AMSO got this right too! I've mentioned it before, but this 11 minute video of Apollo 11 simulated in Orbiter with AMSO is really cool. It recaps the whole Apollo mission and shows you what Orbiter and AMSO can do (with great production and music too). You can download a higher resolution version of "Apollo 11 Remastered" from the Tex-Films web site, along with many other Orbiter and other simulation videos. I just watched the ISS sailing over for about 5 minutes. We had thunderstorms earlier and there were still clouds around, but the station's path from southwest to east-north-east was clear. There are good mid-evening passes over the northeastern US the next few nights - check this web site with your zip code to find the times and directions. The ground track map is from Heavens Above which provides more detailed information. 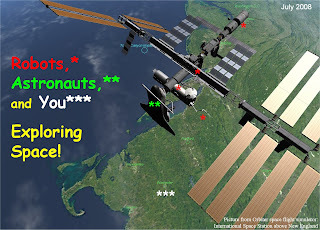 Carnival of Space #63 is running this week at Angry Astronomer, a new blog for me. I looked at Jon's profile, and it doesn't explain why he's angry (I actually once explained Flying Singer), but he sure has an interesting animated gif "avatar" on his sidebar. I thought it must be his picture until I saw the name of the file, dawkinsthrust.gif. I looked closely, and sure enough, it's my godless idol Richard Dawkins, thrusting like mad and wearing an evolving fish symbol on his pasted-on baseball cap. Cool. P.S. 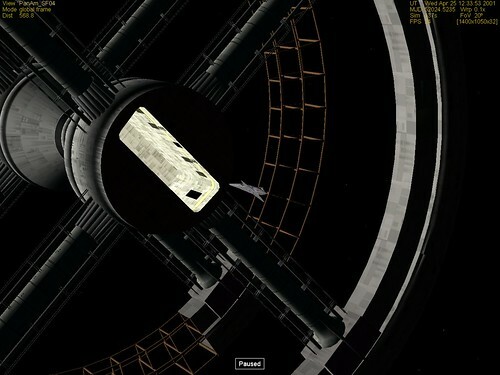 I don't know why but animated gif's like this one don't animate on my blog. Now this is a scary essay by an Israeli professor of history. He says that Israel is likely to launch a military strike to try to destroy Iran's "peaceful" nuclear development program before Iran actually builds their own nuclear weapons. Some in Israel believe this could be achieved by late 2009, and that once Iran has the bomb, they will use it to destroy Israel, so someone must act - if the US doesn't, then Israel must. Prof. Morris thinks that November 5 to January 19 (between the US election and Inauguration Day) could be the best window for this very difficult military operation, and that if it fails, that Israel might use its own nuclear weapons to finish the job. 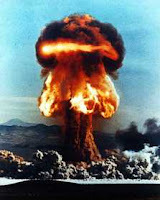 Nuclear war in the Middle East?!? We'll be longing for those lazy summer days of 2008 when gas was available and only $4.09 a gallon. And that will be the least of our problems. Morris doesn't work for the Israeli government, but I don't know how independent he is. Is this just his opinion, or some sort of message? It got my attention! I don't have time now to research this deeply, but this recent page features several experts of widely varying positions discussing the question, "How likely is a scenario in which the US or Israel strikes Iran before Bush leaves office?" The consensus seems to be that the situation is dangerous, but that a near-term attack by Israel or the US is not that likely. But not out of the question either. Talk about religion poisoning everything! I guess some people are too impatient to wait for global warming or an asteroid to destroy us. Where's my spaceship? JAXA has released some images captured by the high resolution Terrain Camera (TC) on the Moon-orbiting Kaguya/Selene spacecraft. You can find them in the Kaguya Image Gallery. The most recent (July 14) shows the Apollo 17 Taurus-Littrow landing area. 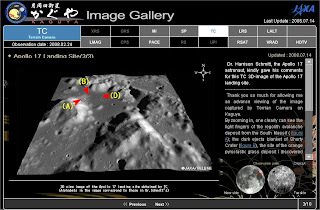 They got Dr. Harrison Schmitt to look at some of the pre-release images and comment on them. He was able to identify some of the geological sites and features that he and Gene Cernan investigated in December 1972. Japanese engineers have reported seeing a lighter color "halo" area that is believed to have been caused by the Apollo LM's descent rocket engine (observed at both Apollo 15 and Apollo 17 sites). At about 10 meters per pixel, this camera is good, but it is still not at the level of MRO which has returned pretty clear images of Phoenix and the Rovers on the surface of Mars. 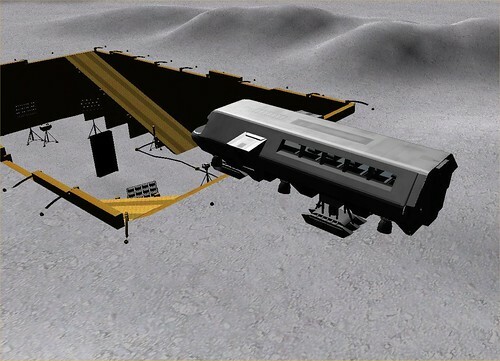 The upcoming LRO (Lunar Reconnaissance Orbiter) mission will have enough resolution to see the Lunar Module descent stages and other hardware left behind on the Apollo missions. This (September 2008?!) article from Air & Space Magazine says that LRO will be able to image objects on the surface "the size of a microwave oven." That should just about do it, though I don't expect Moon landing hoax conspiracy nuts to be satisfied, seeing as LRO is a NASA mission too. There are all sorts of demonstrations of the relative sizes of things in the universe, including the famous Powers of Ten video (here's an interactive Java variation on that). This animated GIF takes a sequential pairing approach and focuses on planets and stars, and it's really cool. Hard to believe that there are some stars even bigger than Miley Cyrus! Thanks to Cumbrian Sky for the tip. I read a long time ago that there was a rescue mission planned for the Hubble service mission this fall, but I hadn't heard any details. Today I found this June article from ABC News and learned a little more. All recent shuttle missions have visited the ISS, and if there had been any problem with the shuttle that would prevent it from entry and landing, the shuttle crew could "camp out" at the space station for quite a while (nearly 3 months) if necessary while a rescue shuttle was prepared and launched. These rescue missions were planned for as a contingency (STS-300 series missions) for each mission, but because the ISS could provide weeks of safe haven, it wasn't necessary to have a shuttle on the pad. They would have a few weeks to get one ready and launch. Hubble orbits at an altitude of almost 600 kilometers with an inclination (angle from the equator) of about 29 degrees. 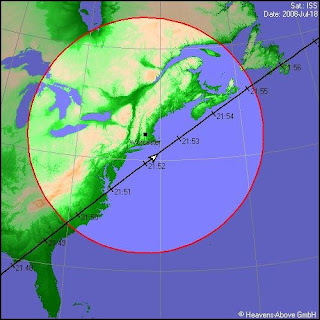 The ISS is much lower (around 340 km) and at a higher orbital inclination (about 51 degrees), so there is not enough propellent on board Atlantis to get from HST's orbit to the ISS if there were trouble (assuming it could even maneuver). So any rescue mission would have to launch fast - the HST service crew on Atlantis would only have around 23 days of consumables. For this contingency, NASA has the STS-400 rescue mission, which requires having the rescue shuttle on the pad at KSC so it could be prepared and launched within a week in case the HST shuttle gets stranded. For STS-125 (Atlantis), the rescue shuttle would be Endeavour, and both shuttles will be on the pads in October when STS-125 launches. This has happened occasionally before, but this is the last time it will ever happen. This isn't considered very likely (I read 1 chance in 400), but it's good to have a plan ready, and it would be cool (and possible) to simulate it in Orbiter. 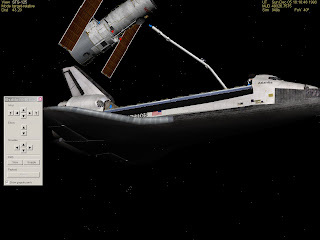 I edited a quick scenario with Atlantis (HST) and Endeavour (rescue) just to have a look. I haven't tried the grappling, tethers, or EVA transfers yet (all possible to simulate in Orbiter). I think it looks cool to see two shuttles orbiting a few meters apart at right angles to each other. But I hope we don't get to see it for real! I've finished my "Robots, Astronauts, and You" PowerPoint (with lots of bells and whistles), and I'm working on the Orbiter scenarios that I will use during my upcoming talks. I always try new things but usually end up using a few old reliables like a shuttle launch, an Apollo moon landing, and a solar system tour. This time I think I will start with the recent STS-124, with Discovery still docked at the current configuration of the ISS and passing over New England. I'll give a little tour of the robotic bits of the ISS (mainly robotic arms including DEXTRE, and automated supply ships, Progress and ATV). Then I will talk about exploration robots (HST, Mars Rovers, Cassini, Phoenix) and do a robotic session with Orbiter - land Phoenix on Mars and deploy its systems, then simulate Hubble pointing at and zooming in on Jupiter and Mars from Earth orbit (using the telescope MFD, a simple add-on that allows you to view and zoom in on objects as seen from a designated spacecraft - the spacecraft doesn't have to be a telescope or even point at the object, it's really a sort of "display hack" in Orbiter). I will also fly Cassini through the rings of Saturn with a close pass near Titan. Finally for the astronaut section, I think I will go with a Saturn V launch and an Apollo landing (using the great AMSO add-on), maybe Apollo 15 for both (so I can deploy and drive a Lunar Rover), and if there's time, I will simulate part of this October's STS-125, grabbing Hubble with the RMS and placing it in the payload bay of Atlantis. I don't have all the proper mounting hardware for the bay and I'm not that good with the RMS system, but if I set it up almost ready to grab (and use 10x time acceleration for moving the arm), I can do it pretty quickly. A quick EVA (mainly to show the size of HST and the shuttle) and I'm done. Can this all be done in 90 minutes (with a good break in there)? I think so, but that's why I'm practicing chasing HST today! You can see in the bottom picture that Orbiter gives you some help - you can turn on colored arrows pointing to the valid grapple points, and you can go outside the shuttle to get a better view of the problem. The real shuttle has nicer windows and a few of its own computer aids for RMS operators. I'm sure plucking the huge Hubble from orbit is something the mission specialists have practiced a lot in their own simulators. I briefly considered trying to get tickets to see John Mayer or Lucinda Williams, both playing in the Boston area this weekend, but I decided to pass. Concerts are cool but they are also expensive and a lot of trouble, and I have a lot to do this weekend. This got me thinking about great and not-so-great concerts I have attended in my life. I never was a major concert goer, but I have been lucky enough to attend some great ones over the years. So here's a sort of top 10 list. Some dates are approximate. Who didn't make the list? Some I remember as good but not amazing include Arlo Guthrie, George Benson, Bob Dylan (Worcester 2002), BNL (twice), The Beach Boys, and Chicago (1973). A few that were disappointing include Led Zeppelin ('73 or '74 in Pittsburgh, people throwing firecrackers into the stadium crowd ruined it for me); Crosby, Stills, and Nash (Pittsburgh '75 or '76, not that good live); and Ringo Starr in 2006 (just OK, but hey, he was in the Beatles). There are lots of people I wish I had seen - some I maybe still could see if I weren't so lazy about concerts now. Simon & Garfunkel, Paul Simon, Elvis Costello, The Police or Sting, Joni Mitchell, Billy Joel, Van Morrison, Dave Matthews, probably more. My biggest "I coulda been there" was Woodstock in 1969 - yes, the Woodstock. I was working in a restaurant in Lake George, NY, the summer before my senior year in high school. Two of the guys I worked with were going to this big outdoor concert in Bethel, NY, just a couple of hours drive south, and they asked me if I wanted to go. It sounded cool, but I needed to work and save more money, and it would have been hard to convince my parents to let me go (but probably not impossible). Guess I blew that one! Over at the Planetary Society Weblog, Emily Lakdawalla wrote a wonderfully educational post the other day on this amazing picture of the Phoenix spacecraft as it descended under its parachute, taken by the Mars Reconnaissance Orbiter (MRO) HiRISE camera . As Emily explains with the help of HiRISE optical expert Timothy Reed, there was much more to this well-known image than meets the eye. You should read her excellent explanation, but let me summarize the key points (it's OK, I'm an optical engineer - don't try this at home!). Basically the HiRISE camera is like a digital camera with one long, skinny row of pixels (it's really more than one row, and it's not exactly straight, but read Emily's post for those details). Instead of 2816 x 2112 pixels like one of my cameras, it's like 20,000 x 1. So how does it take full rectangular pictures? 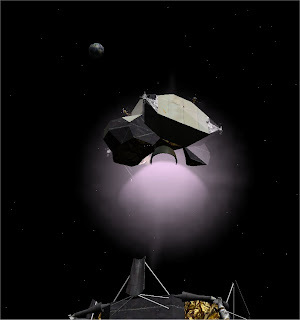 It takes advantage of the spacecraft's known motion along its orbit. It grabs one row of 20,000 pixels, moves a little along the orbit, then takes the next row, and so on (this is also simplified, see Emily again). This "pushbroom" method only works well if the row of pixels is perpendicular to the ground track, but the spacecraft is designed to hold itself in the right orientation for this to work. As it zooms high over the surface in its almost circular polar orbit, it records long, skinny strips of images 20,000 pixels wide of the fixed ground passing below. Cool. But what about the Phoenix? It was moving in a different direction, not parallel to MRO's orbital ground track. So the clever MRO engineers set it up so the spacecraft would temporarily rotate ("slew") along the direction and at the rate of the predicted track of the descending Phoenix spacecraft (at just the right time! ), thus allowing a sharp image of Phoenix to be captured. Of course this meant that the ground in the background was not "moving" perpendicular to the HiRISE row of pixels, so there was some blurring and other stuff there. But that is still some juggling act! Optics, orbital mechanics, and spacecraft control systems combine to get an amazing snapshot from Mars (not to mention terabytes of high resolution surface images constantly streaming back to Earth, which is MRO's real job). Whew, my partial explanation is almost as long as Emily's full explanation, but I hope it helps. Now go read her post - it has additional complexities (but also additional pictures). I’ve just finished Barack Obama’s second book, The Audacity of Hope, subtitled “thoughts on reclaiming the American dream.” It’s quite inspiring to read the words of this caring, brilliant, insightful, balanced, and still ordinary man. It is clear that he has thought deeply about the many issues facing this country, and he discusses these complex problems in language that is grounded in common sense and that is focused on the basic things we have in common as Americans and more so as human beings – things like families, values, individual rights, and the desire to be treated fairly. His chapter titles show the range of his thoughts – Republicans & Democrats, Values, Our Constitution (he has studied and taught constitutional law), politics, opportunity, faith, race, the world beyond our borders, and family. He has ideas and approaches on all of these many problems, but he doesn’t pretend to have definitive answers to everything. He does make it clear that answers that don’t put people first, that don’t recognize the realities of the “global village” of the twenty-first century, that don’t take a wide enough view, or that are based on wishful thinking about the way things used to be – that those aren’t really answers at all. Obama’s love for this country is apparent on every page in this book, but his is not the patriotism of “my country, right or wrong” – it’s the patriotism of someone who knows and cares for our diverse American people, who knows the great things we have achieved and can still achieve, and who knows that no matter how powerful America may be, that we are still members of a family of nations, all of us sharing a fragile planet. Obama’s life is itself a microcosm of the American experience. He’s the son of a woman from Kansas and a man from Kenya, he has relatives in Africa, Indonesia, Hawaii, and elsewhere. He eloquently told the story of his early life and his search for his identity in his first book, Dreams from my Father, which I also read recently. In the last week there has been some press about how Obama is supposedly “tacking to the center,” adjusting his positions on various issues to be more mainstream, more acceptable to a wider range of voters in the general election. If you read this 2006 book, you will see how wrong that is. Although Obama is proud to call himself a Democrat and a progressive, his positions are and have been based more on finding common ground and achievable solutions than on sticking to party doctrine. As he says in his chapter on values, “The political labels of liberal and conservative rarely track people’s personal attributes.” He’s talking there about Americans in general, about how people typically hold a mix of views. But it applies to Obama as well. Does this make him wishy-washy? Not at all – it makes him American, mixing idealism, optimism, and pragmatism with a strong dose of roll up your sleeves and get it done. What I like about this book and about Obama himself is that while it is about politics, it really feels like it is about life. Obama is not Superman, and electing him president will not make everything all better. The problems are too big to just whisk away. Obama is optimistic but he is not naïve – he understands the need for political and military power in the world, and under his presidency, I think the US will regain some respect in the world. We won’t be a bully, but neither will we be a wimp. With the fundamental strength of our market economy and our large and diverse population, people can work together to make things better here if they are given some hope and some opportunity. And we can work with other nations to help make this world more just, and ultimately safer and more stable because of this. With the giant weight of the Iraq War and our current head-in-the-sand energy policy, it will not be easy to get our economy back on track, maintain our security, and prepare for the future by improving education, energy, and much more. But I believe that Barack Obama has the best chance of leading us in the right direction, and of assembling a capable team and inspiring the American people to work to help us get there. That’s why we need to elect President Obama this fall. P.S. Obama has a lot of great material on his web site, but if you have doubts about him, or even if you like him and think you know something about him, I strongly recommend reading both of his books. If you only have time for one, I guess it should be Audacity since that deals most directly with our current situation, but his first book is well worth the time if you can read both. And lest you think that I believe Obama walks on water, I have to say that as a secularist (to put it mildly), I am not completely comfortable with his support for faith-based initiatives, though I understand his position on a practical basis, and I know that he stands strongly for the separation of church and state. As a space and education guy, I also believe that he has sold NASA short. He plans to delay the Constellation program by five years and to use the savings (small by social program standards) to fund some early education programs. It’s true that NASA may not be as inspirational as it was in the Apollo era, but it is still a powerful force for science and technology that could be better coupled to education rather than pushing it aside. Moving beyond low Earth orbit can be inspirational, even though went to the Moon 38 years ago. But to be honest and practical, on a greatest-good basis, these are pretty small things – he doesn’t have a religious agenda, and he doesn’t plan to shut down NASA. 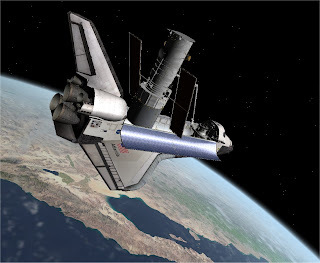 I've written about it before, but I was reminded just now by a discussion thread at Orbiter-forum of one of the most amazing add-ons ever created for Orbiter, World of 2001 (be sure to download and watch the 3 minute video "Floyd's Journey" to get an idea of the quality of this add-on). In 1968, just as Apollo astronauts were about to reach the Moon, Stanley Kubrick and Arthur C. Clarke showed us the astounding potential of our space future in their film 2001: A Space Odyssey. This huge and multi-faceted add-on by the team of Erik Anderson (Sputnik), Alain Hosking (80mileshigh), and Wolfgang Schwarz (Nautilus) allows you to experience some of that world first-hand. It includes most of the space vehicles and bases from the film plus others that were only mentioned in the script or the book. It does not include the Discovery and related vessels which are available in a separate add-on by David Bartles. You also need to import your own Strauss waltzes to play through Orbiter Sound. The "world of 2001" shown in the film is a world that could have come to pass (in some form) if we had continued to invest in space at the rate of the Apollo era for 20 more years. That was not sustainable, although the fact that Pan Am was operating some of the spacecraft in the film suggests that commercial interests might have played a big role once the necessary infrastructure was in place. In the film, the Soviet Union and presumably the Cold War were still going strong, and that was what drove Apollo, though it's hard to imagine a space race that was a proxy for war lasting long enough to create the level of space activities seen in 2001 (without a real war occurring somewhere in there) if that was the main driver. Of course they couldn’t know in 1968 what would happen to the Soviet Union by the late 1980's. And of course we did have Vietnam as another sort of proxy for the conflict between the US and USSR (or between communism and the West). I may be just a romantic space geek, but I sure would have preferred Kubrick's 2001 to the crappy 2001 we ended up experiencing. Now it will probably take until 2051 to get to 2001, but with private space and other governments' help (through cooperation and/or competition), maybe we'll still get there. Carnival of Space #62 is up, and the format is really cool, a Flash-based image gallery of the 21 submitted posts. The host is Space Disco, one of seven new space-related blogs at Discovery Space (Discovery as in "Discovery Channel"). With Phil Plait's Bad Astronomy blog now hosted by Discover Magazine, I guess you could say that the more mainstream media have discovered space blogging. As is often the case, I discovered an interesting new blog this week, Simostronomy, with a great post about Maria Mitchell, the first American woman astronomy. I also really enjoyed the guest-post from the always intriguing Centauri Dreams on the Tau Zero Foundation. So many great things to read and write about, so little time. 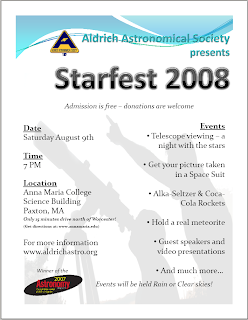 The Aldrich Astronomical Society has announced plans for Starfest 2008 (PDF), which will be held Saturday evening, August 9, at Anna Maria College in Paxton, Massachusetts, a few minutes north of Worcester. There will be telescopes, spacesuits, meteorites, rockets, and various presentations, including my own session, "Robots, Astronauts, and You," which will feature simulated shuttle launches and moon landings, among other things. If you're in the area, bring the family and come check it out - it will be educational, fun, and free. It's no secret that NASA plans to retire the space shuttle by the end of 2010, but I was still a little saddened to receive a KSC press release just now with the subject "NASA Sets Launch Dates For Remaining Space Shuttle Missions." After STS-125 (the final Hubble servicing mission set for October 8), there is one more ISS mission this year (STS-126, November 10) and five ISS missions in 2009. There appears to be only one set mission for 2010 (STS-131 in February) with two "shuttle-equivalent flights for contingency" (STS-132 and -133). The Consolidated Launch Manifest also lists several Russian and one Japanese non-shuttle launch with ISS completion tasks. 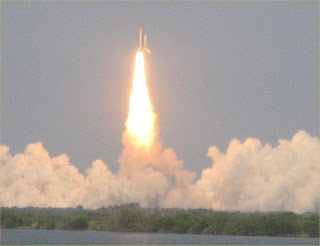 I'm glad I got to witness a shuttle launch at KSC last August (Endeavour on STS-118). That's my photo above - not the greatest shuttle launch picture, I know, but I took it. If you haven't gotten to experience this in person, I highly recommend doing so while you still have a chance. I hope to witness one more myself in the few remaining months of the program. 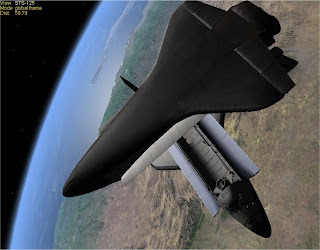 Born out of cost-cutting compromises that never allowed it to be a truly low-cost, fully reusable vehicle, the shuttle experienced its share of problems and two major tragedies. But it flew hundreds of people in space and accomplished some amazing things, including the launch and repair of the Hubble Space Telescope and the enormous space construction project that is the ISS. It will be a long time before we see a manned vehicle as awesome as this "space transportation system." We're nearing the end of a remarkable era. The latest Carnival of Space is the "Tunguska Edition," marking the hundredth anniversary of the Tunguska Event on June 30, 1908 (which I wrote about on my birthday, which was not a hundredth anniversary). This week's host is Mang's Bat Page. There are a few posts on Tunguska (Astroprof provides an excellent overview) but a lot more on other spacey subjects. Check it out. 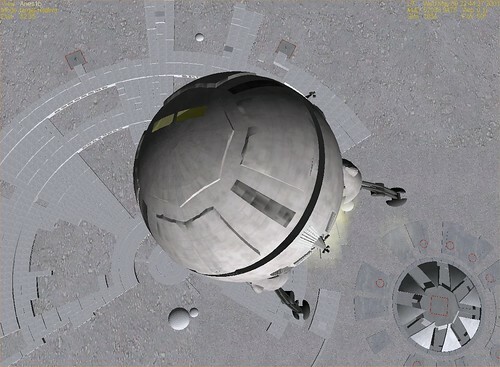 The screen capture here is from Orbiter, with only "impact event" surface features selected. Tunguska is near the center of the view, and you can see there are quite a few others. I'm working on a new presentation for a couple of space/astronomy events I have coming up this summer. For the last year or so, I've presented a frequently updated PowerPoint with the title "Exploring Space with a Computer." This is basically a framework for talking about the great (and mostly free) space and astronomy resources available on the web, using web materials to focus on whatever news or missions are current at the time. This is usually followed by live demos of Stellarium and Orbiter, and I typically customize these to current events too - showing Comet Holmes in Stellarium, or using Orbiter to land a simulated Phoenix spacecraft near the Martian north pole. Although PowerPoint is great for organizing background materials, the live demos are what really get people's attention. I could simply update my presentation and demo scenarios for recent space events, but I decided to create a new framework that emphasizes the amazing work of robots (designed, built, programmed, and operated by clever humans, of course) and also talks about the advantages of highly adaptable human astronauts for missions such as space construction and repair. Of course humans are also quite good at actual exploring, though they haven't had a chance to demonstrate this since Apollo 17. I plan to also talk about synergy between robotic systems and astronauts, as we have seen on ISS missions and will certainly see more of in the future (e.g., NASA's Robonaut program). The challenge is to keep this interesting, not too wordy or technical, and suitable for kids from six to eighty-six (my age range to date). 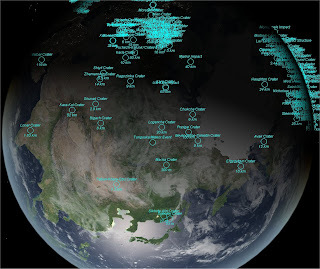 And to really emphasize the live demos, because that's where the "you" comes in - the web and free programs like Stellarium, Orbiter, Google Earth, and the new World Wide Telescope help to make space and astronomy more participatory than ever before. I'm planning this for a one hour presentation, though the great thing about Stellarium and Orbiter is that it's easy to show more cool stuff if time is available. I typically include at least one shuttle or Saturn V launch (nice and noisy) as well as a landing somewhere (typically the Moon or Mars), and if there's time, I will dock with the ISS and maybe play a little "name that body" game, using an Orbiter scenario in which I have placed a bunch of different spacecraft around the solar system (I could just jump to each body from a dialog box, but audience members can usually read the planet names on the screen, so that's not much of a challenge). I've had some kids as young as 7 who really knew their planets and moons. I will present this at the Beaman Public Library (West Boylston, MA) on July 15 and next at the Aldrich Astronomical Society's STARFEST 2008 at Anna Maria College, Paxton, MA on Saturday August 9 at 7 pm. If you're in the area, stop by - STARFEST will have a lot more going on than just me, including spacesuits, meteorites, and as many as 15 telescopes set up for public viewing (if the weather cooperates).